Choose from a wide catalog of dresses made from cotton, Polyester, chiffon & many other fabrics. 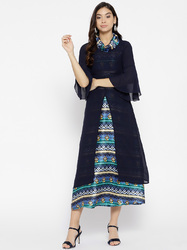 Chanderi Brocade Asymmetrical jacket with Frill layered skirt in wrinkle texture by Alkaz Studio !!! Designer American Crepe dress for women in Black color.